Lebanon's parliament has, after long delay, passed a law which allows Palestinian refugees to work legally. There are an estimated 400,000 Palestinians living in Lebanon and, given its delicate sectarian balance, their status is a sensitive issue. Many are still living in camps where conditions are dire. But the law is unlikely to transform their lives, as they will not be able to work in the public sector or for certain professions, nor buy property. To meet objections from a number of Christian factions, the legislation was heavily diluted from the version proposed earlier in the summer by the Druze leader, Walid Jumblatt. The proposal to accord Palestinians the right to buy property aroused fierce opposition from those nervous that it might lead eventually to the permanent settlement of Palestinians in Lebanon. Under the new law, Palestinians will have the right to claim free work permits for employment in the private sector. They will also be able to claim cover for work-related accidents and retirement indemnities from their own social security fund, to which they will pay contributions while working. This marks a step forward from a situation where the Palestinians were barred from all but the most menial of jobs. But the advances remain well short of the rights enjoyed by Palestinian refugees in Syria, Jordan and elsewhere in the region. Palestinians in Lebanon will still be unable to work in the public sector or in professions such as medicine, law or engineering, where membership of Lebanese syndicates is compulsory. They will also continue to be denied access to Lebanese state medical or educational facilities. Those services are provided to the refugees by the United Nations Relief and Works Agency (Unrwa), which is currently suffering from a severe financing deficit. Some Lebanese factions, especially the Christians, want the international community to come up with proper funding for Unrwa, and to emphasise that the Palestinians have a right to return to their original homes in what is now Israel. They would also like the Lebanese state to assert more control in the 12 Palestinian refugee camps, sprawling slums where armed guerrillas are in control. Many have open sewers running through tight mazes of alleys. There are severe restrictions on repairs and improvements to the cheaply-built dwellings. Some of the youngsters who throng the camps are fourth-generation offspring whose great-grandparents fled what is now northern Israel in 1948. Many Palestinians work informally outside the camps, with the authorities turning a blind eye. Now, that employment will have legal cover. But some Palestinians would prefer things to stay as they are, rather than, as one put it, "having to register and get a work permit, providing Lebanese officials with another opportunity for corruption". But Ziad Sayegh, an expert on Palestinian refugee rights, said that the new legislation would make a difference. "For the first time, it actually gives them some legal rights," he said. "If an employer treats a Palestinian worker badly, he can now go to the court and complain." But he admitted that in broad terms, the law would have little effect in changing the overall social and economic situation of the refugees. 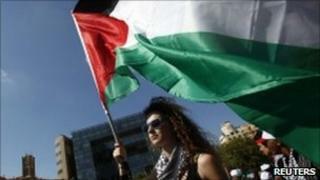 It met with a generally sceptical response among the Palestinians themselves. "They spent a long time on discussions which emptied the law of any real meaning, and I wish they had put it off so we could push for a better version," said Suheil Natour, spokesman for the Democratic Front for the Liberation of Palestine (DFLP). Palestine Liberation Organisation (PLO) leaders in Lebanon have politely welcomed the move as a step forward, but said they will continue to press for more rights - while agreeing absolutely that their ultimate ambition and demand is to return to their homeland. The new legislation at least provides Lebanon with something it can hold up to show critics of its human rights record. Giving the Palestinians more rights is so sensitive because their arrival in successive waves strengthened the hand of their fellow-Sunni Muslims in the Lebanese sectarian arena, at the expense of the Christians. During the civil war which broke out in 1975, Palestinian factions were deeply involved on the Muslim, left-wing side against right-wing Christians. Given the tough reaction of Christian groups to the new legislation, it is hard to imagine them agreeing to more liberal laws any time soon.